In August of 2018, Swedish student Greta Thunberg, then 15, did something courageous and bold. She protested alone outside the Swedish Parliament House calling for urgent action on climate change. This inspired a movement of young climate activists spanning the globe. It wasn’t long before we got in on the movement here in the UK, which resulted in the largest ever youth mobilization for climate justice this country has ever seen. So how did we get to that point? Well, the UK Student Climate Network was established after UKSCN co-founders Anna and Ivi engaged in a collaborative effort with the early organisers of Youth Strike 4 Climate. They chose a date, the 15th of February, and what followed was a massive outpouring of youthful passion and anger. Initially hoping to mobilise hundreds of students across the UK to walk out of lessons, everyone was positively surprised when over 15,000 did! This showed that young people are longer accepting of being pushed out of the most relevant dialogue of our generation. 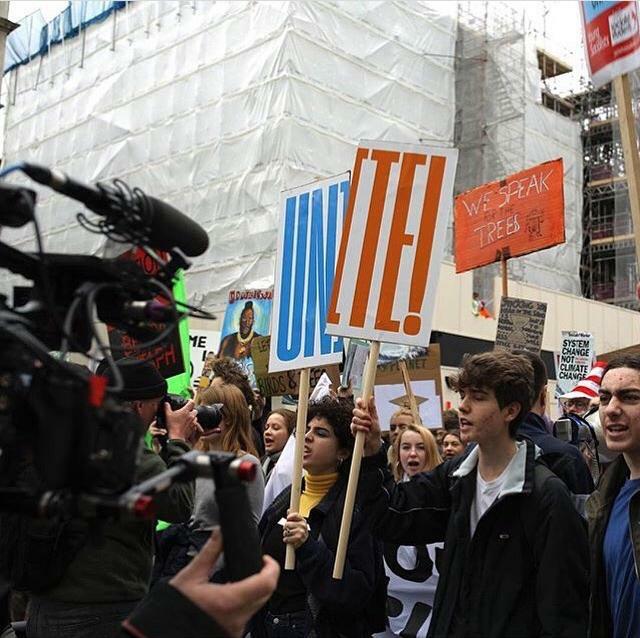 When 50'000 students then took to the streets on March 15th for the Global Strike for Future, UKSCN fuelled the fire in the stomachs of thousands of young people across the UK calling for change. In order to embolden this movement, we need your support. We are looking to raise £50’000 to ensure that on the 12th April and beyond, incredible young organisers across the country can access the tools they need to amplify their voices. Voices calling on the government to take immediate and effective action to address the climate crisis and avert catastrophic climate breakdown. So now you’re probably thinking, how will we use these funds? UKSCN is a grassroots movement, predominantly powered by volunteer efforts from young people and students. We make the decisions, we set the strategy, and we keep our voices at the very forefront. However, we recognise that in order for our campaigning to be as effective as possible, and to mobilize large numbers of students across the UK, we need a little bit of support from those that can offer their experience. We’re looking to work with at least one full-time campaigner, with the potential to expand this based on the amount we can raise. We’re ambitious, so we hope you are too! The day-to-day management, organisational development, fundraising, and media and press work - to name just a few areas - all take a lot of time and require full-time capacity. We’ve mostly been operating through a number of individuals donating their time, but we want to be able to compensate those working with us fairly. We’re looking to expand our capacity for campaigning, but this will be limited by any number of factors, but we certainly don’t want staff capacity to be one of those. Help us reach our target so we can pay a good wage to those that are on board with our mission, our message, and have our interests firmly in mind. It’s really important to us that we can allow people from diverse economic backgrounds the opportunity to work with us, and not be limited by their ability to work for free! So much of the organising carried out by UKSCN is done in communities. We have often relied on space being lent to us by sympathetic individuals and organisation for which we are grateful, but now we're looking to step up our game. We are looking to rent space long and short term so that students can come to work on the strikes whether that's making banners together or meeting to discuss strategy, giving space for people to meet in person provides the valuable opportunity for deep understanding and communication. In the economy we're trying to reform, renting space is very expensive and we've so far been operating on a near-zero budget. Whether it’s getting a sign language interpreter across London to make our speeches more accessible, or a train ticket so a key organiser can make an important meeting, it all adds up! We’re a decentralised network all around the UK and that means your pledges can facilitate even better interaction and collaboration between all of us across the nation to organise and implement climate action. Additionally, our students have travelled to conferences in Paris, Strasbourg and are invited to attend events all across the UK. These not only provide great opportunities to influence decision-makers and spread the message, but they can also be hugely inspiring. 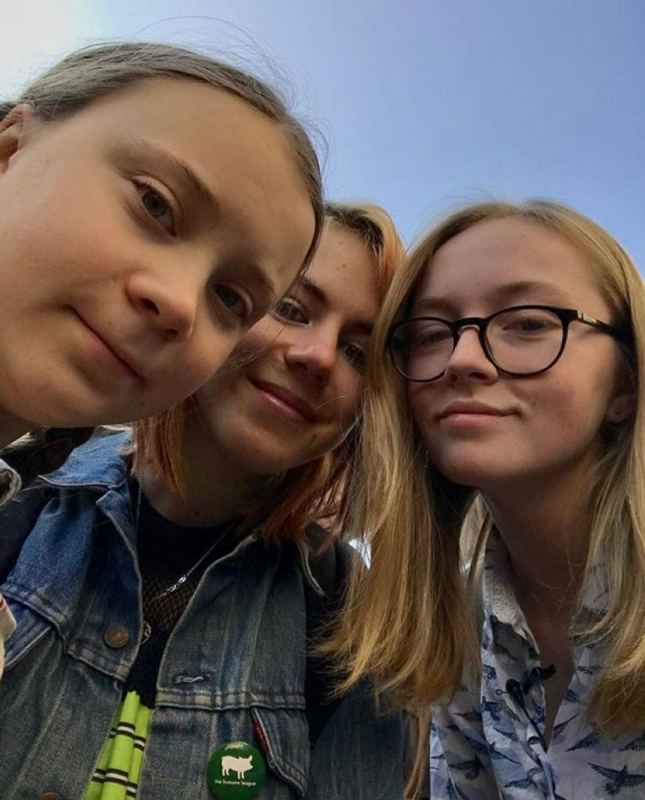 When two UKSCN activists went to Paris, they met Greta Thunberg herself. As a climate movement, we seek to only fund low impact modes of transport such as trains and buses so you can rest assured we won’t be jet-setting around the UK or Europe on a plane. At the moment we’re running a shoestring budget which is holding us back from doing what we want to and achieving the big changes we need to see in the world. Whether it’s hiring PA systems for large demonstrations or buying materials to make banners or props, we need some money to make it happen. 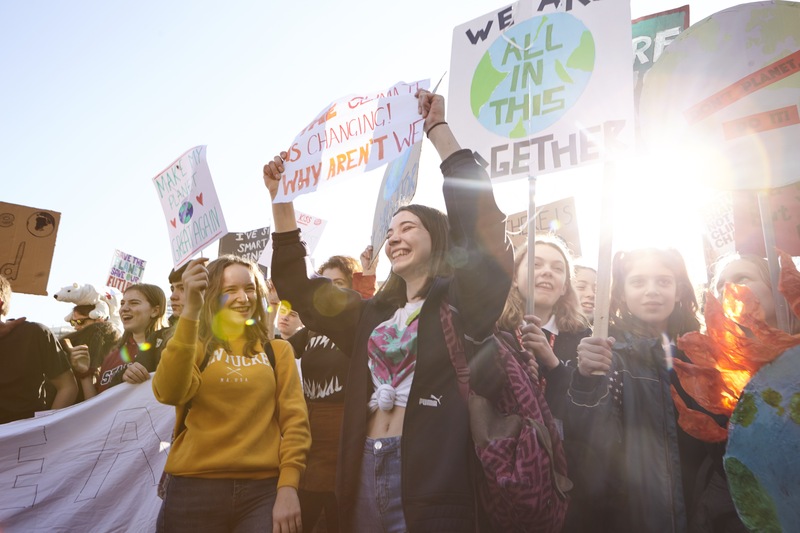 Your donation will help us be able to hire sound systems for the biggest YouthStrike4Climate demonstrations in the UK to really amplify youth voices and ensure young people are heard. We also have plans to get creative with our demonstrations. Props, banners, water-based paints and brushes aren’t cheap, neither are community centres or spaces to rent where we can host arts sessions. We also need to subscribe to or purchase some digital tools. Organizing thousands of people isn’t easy and requires access to quality mailing servers that we can securely store the contact details of all our support. Your donation will allow us to purchase some key campaigning tools that will increase our effectiveness and give us further amplification online. We also have talented creatives among our supporters, providing the right software to harness and develop their talents will help sustain the movement’s creative output. By pledging to our Crowdfunder, you’re not only supporting young people to take bold and courageous climate action, but you’re also giving us a chance at having the tools and resources to fight for our futures. We don’t have an option to fail, our very lives depend on it.  Your UKSCN t shirt will feature an exclusive design and is ethically sourced. All donations are vital to keep UKSCN running. We want to say thank you to all of our amazing pledgers. We work with many talented creatives and designers so you can be sure your badge will be an interesting and exclusive memento of your support for our movement. To remember this emboldening and pivotal period in student climate activism, you can get your hands on a limited edition poster, hand designed by us. For such incredible support, we'd love to meet you to express our gratitude for your solidarity and how your funds are being directed. This pledge offers a way to get unparalleled insight into the workings of UKSCN. At this pledge level, we're offering all of the above rewards plus a position on our website as a top supporter of UKSCN if you wish.